At TGS, you are yelled at. You might be yelled "Good morning!" In Japanese. You might be yelled to come over and try a game, usually through a megaphone that is sometimes pointed toward the ground in what I guess qualifies as passive-aggressive megaphoning. You must keep the line tight. Imagine that you and I are standing next to each other. Nope. Wrong. You didn't imagine that we were close enough for a TGS line. Twice, while waiting to play Nier Gestalt at Microsoft"s booth on Friday afternoon, I was ordered to close the six inches between me and the person in front of me. I could cope with the yelling and the enforced proximity. 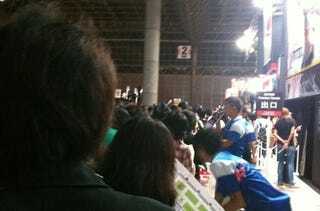 The TGS people are surely trying to manage the bulge of people attending even this year's smaller show. The United States may have given birth to video games, but it was Japan that brought them to life. I also better understood, after that Nier experience (stretch of a pun intended, readers) why a lady seemed determined to cut ahead of me in a line for Okamiden earlier Friday morning. My line-waiting for Okamiden intrigued me so much, in fact, that I decided to liveblog it. Forgive me for having a low threshold for liveblogging. I once liveblogged my walk across the street (and back!). I have, in recent weeks, liveblogged men who spoke for almost three hours, which may have overdeveloped my liveblogging muscles. So, yes, I liveblogged my line wait. Then I cut it off, for reasons I will explain shortly. 9:52 But not as long as the line to my left at the Level 5 booth. 9:57 Line has barely budged here despite booth man telling me the wait would be all if 10 minutes. I think the lady behind me is trying to cut ahead of me. 10:00 These are the stakes: In one hour, I need to be at Capcom's media suite to talk to the developer of the Ace Attorney game. Too bad they don't have Okamiden there. 10:03 Capcom man comes by with a placard that he invites usto take pictures of. It will zap some Okamiden stuff to our phones. I choose to live without it. This liveblog ended abruptly when I discovered that I wasn't on a line to play Okamiden. I was on a line to get a ticket to get on a line to play Okamiden. The ticket I received was for 11:20, a time to which I could not commit. I called Crecente and gave him my ticket. I suspect that some of the novelty of this TGS line-waiting was due to the event being open to the public rather than because it was in Japan. I've attended mostly non-public gaming shows such as Game Developers Conference and E3 — where the only efforts to expose attendees for non-professional swag-ready fans are the tossing of free t-shirts and the decreasingly frequent hand-outs of game-related knickknacks. No one enforced tighter line-squishing at those. And no one had things you could photograph with your cellphone (unless you count booth babes as "things" — please don't). Other things learned from my line-waiting: They keep you on a time limit at TGS. Just five minutes or so on a game is all you get; then you're booted. And they keep it clean, with squirt bottles at many doorways asking attendees to cleanse themselves of any H1N1 or other viruses they might have just sneezed into your hands. Before and after I got my turn to play Nier, a booth worker gave the 360 controller at the demo station a wipe. I don't think there's any grand idea we can take from this. But I'd never been on a line at TGS and, I suspect, many of you haven't either. Just wanted to share.